A new Perfect Guard that sets up for your next turn. Auto: [Choose 1 card from your hand, discard it] When this card is placed on (GC) from the hand, you can pay the cost. If you pay it, choose 1 of your Units being attacked, during that battle it cannot be hit, and if the Unit chosen by this effect is a “Ranunculus” Unit, look at the top 5 cards of your deck, search for up to 1 card with with the same name as your Vanguard or Rear-guard, reveal it, add it to the hand, shuffle the Deck. Today’s Card we’re introducing is from the Character Booster “TRY3 NEXT” (on sale December 9th), “Flower Keeper Dragon”, a Sentinel that supports 《Neo Nectar》’s “Ranunculus”. “Flower Keeper Dragon”, not only does it have the typical Sentinel ability of preventing a Unit of yours from being hit, when the Unit you protect with this effect is a “Ranunculus” Unit, look at the top 5 cards of your Deck, and add 1 card with the same name as your Vanguard or Rear-guard. If you combine it with the Call abilities of “Sacred Tree Dragon, Rain Breath Dragon” and “Ranunculus of Searing Heart, Ahsha”, you can increase the variance of your Rear-guards, allowing you to increase the chances of adding a card with the same name to your hand. 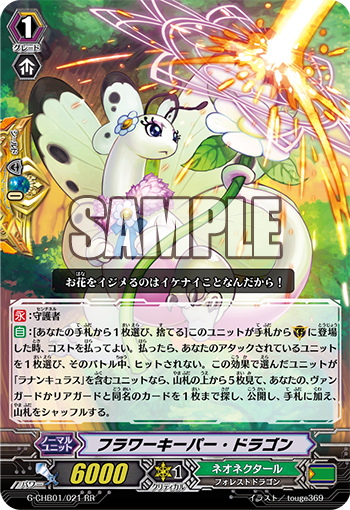 When buidling a Deck chiefly based on “Ranunculus”, this is a Sentinel you should definitely consider adding to it. By adding a card with the 【Bloom】 ability, you can launch a counter attack during your next turn. The Character Booster “TRY3 NEXT” has many cards that supports “Ranunculus”. Today’s “Weekly Vanguard News Bits NEXT” will include a fight using cards from “TRY3 NEXT”, so be sure to check it out!